1-4 p.m. RSVP to 251-8550 by noon on 4/8. 6-9 p.m. RSVP to 251-8550 by noon on 4/8. details if you wish to participate. Please RSVP to events on the Facebook event listings or by completing the RSVP on this page. If an event needs to be canceled due to weather, illness, or emergency, I will need to know how to contact you with that information. You can also check this page and the APOG Facebook page the day of the event to be sure no cancellation is posted. *Non-contracted retreats are hosted by A Place of Grace. They are designed around the monthly theme, and are always open to the public. Call, email, or message me through this site if you are interested in scheduling a retreat. *Contracted retreats are public or private retreats hosted in partnership with A Place of Grace. These retreats may offer the same monthly theme or may be custom-designed for your group’s particular needs. They can be held in a home, a church, a community center, or a place of business, and the partnering host issues invitations to guests. Hosts may choose to invite guests to bring offerings or may make an offering to cover the cost of the retreat for everyone. Call 618-410-5060 to schedule a retreat with Julie! Subscribe to the free​ monthly e-newsletter for first-looks on upcoming events by sending your email and the word "subscribe" via the Contact page here. Grace Grams subscribers get a first look at the calendar and newsletter-only features and Healing Focus articles. As Founder and Creative Executive Director of A Place of Grace, I am committed to supporting area ministries and agencies. One of the ways I believe that gets accomplished is by showing up to be the hands and feet and heart of Christ at work in the world. To that end, A Place of Grace has set a communal goal of 700 mission hours by May 2nd, 2019. To date (1/1/19), we have 611.91/700 hours. No more updates until the anniversary celebration on May 2nd at Von Dell Gallery & Studios! In March, we will work with Hoyleton Youth & Family Services (3/13), Churches on the Streets (3/23), and Operation Blesing (3/27). In April, we will work with Hoyleton Youth & Family Services (4/10) and Caravan OASIS (4/30). You are invited to participate with us! Mark your calendar for the Mission Madness events and email or PM Julie to RSVP. Those who wish to volunteer should contact Julie at least a couple of days ahead to get departure details since we often try to carpool to Mission Madness events. 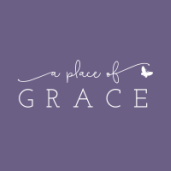 A Place of Grace T-SHIRTS!!!!! Sales tax is included in the price. Additional sizes may be available. Call to inquire. Logo and tagline were designed by Keely Rust. Shirts are screen printed by Keith Bartels of Bigfoot Prints Screen Printing in Bethalto, IL. The next order will be placed when I have orders for thirteen shirts. Email Julie to make payment arrangements.